Many British medal collectors are interested in researching not only the medal, but also the “man behind the medal.” This is the first in a number of blogs which will discuss various materials available on line that may assist the collector in finding additional information on their medal recipients. This blog will discuss a number of items that can be downloaded for free from the The National Archives at Kew, Richmond, Surrey. For those not already familiar with The National Archives, it is the major archival location for British government records and it has an online site, Discovery, which may be accessed online at http://discovery.nationalarchives.gov.uk. Discovery holds over 32 million descriptions of records of which over nine million may be accessed online. The majority of the records available online may be downloaded for a modest fee of £3.45 payable by credit card or PayPal. A few records are available for download at no cost and this blog will discuss a number of these free records which should be of interest to may British medal collectors. This series contains digital images of the London Gazette pages for each Distinguished Service Order from 1914 to 1923 and each Military Cross from 1914 to 1982. The real benefit of these files though is that for each DSO and MC that was gazetted with a citation there are annotations on the London Gazette pages indicating the place and date of the action for which the award was issued and commonly the exact battalion, squadron, battery/brigade in which the recipient was serving at the time of the action – none of this information is usually available in the actual London Gazette citations that were published prior to the end of the Great War. Figure 1 illustrates a sample annotated gazette page for the Distinguished Service Order and Figure 2 for the Military Cross. These files are downloadable at: http://discovery.nationalarchives.gov.uk/browse/r/r/C14593. 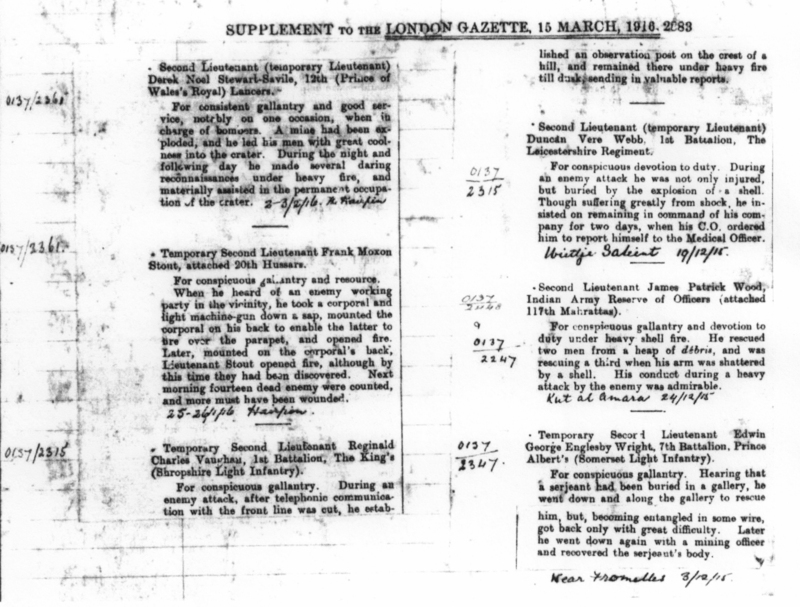 Figure 1: Sample page of an annotated gazette page for the Distinguished Service Order (WO 389). 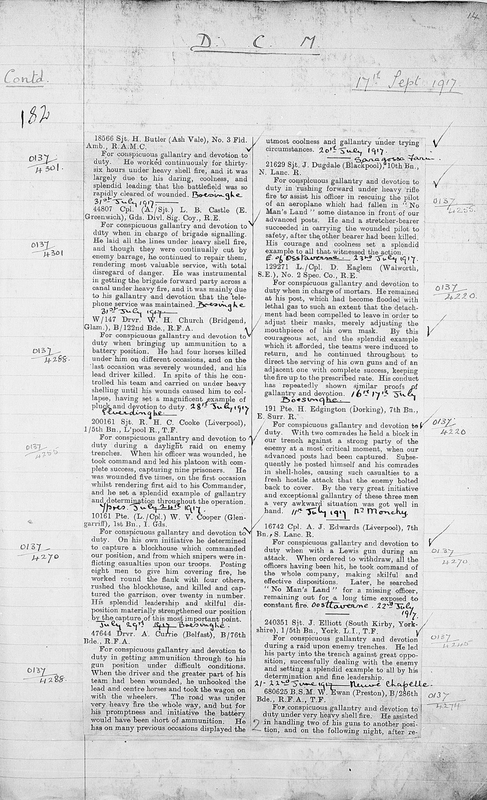 Figure 2: Sample page of an annotated gazette page for the Military Cross (WO 389). The Register of the Distinguished Service Order lists each recipient of the DSO in order of the date of investure from November 1886 through September 1945 and indicates the recipients full name, rank and unit at the time of the award, where and by whom the recipient was invested, the date the warrant was sent to the recipient and an image of the London Gazette entry for the award. A sample page from the Register is illustrated in Figure 3. These files may be downloaded at: http://discovery.nationalarchives.gov.uk/browse/r/r/C14594. 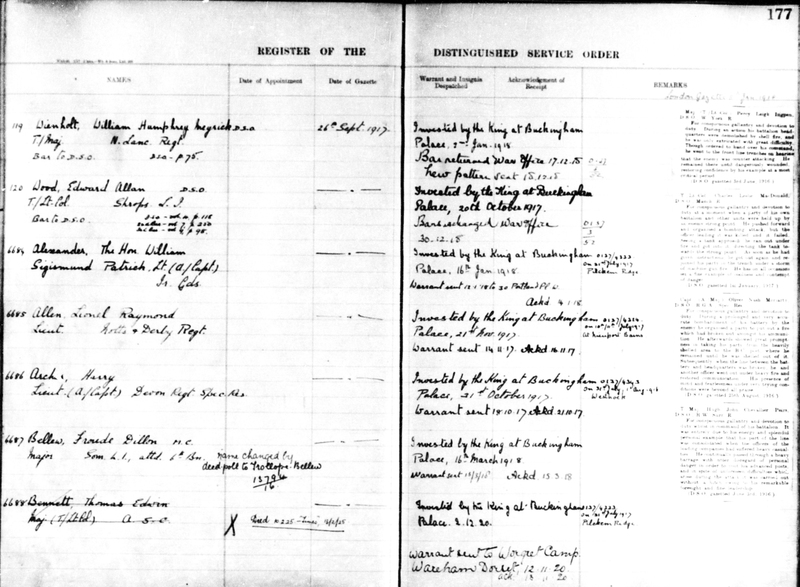 Figure 3: Sample page from the Register of the Distinguished Service Order (WO 390). The Military Cross cards are indexed in alphabetical order with a single card for each Great War Military Cross recipient. Each card indicates the name of the recipient, his rank and unit, and the date the MC was gazetted. If the recipient was decorated by the King (or his designated representative) the card indicates the date of that event in the space labelled “Decorated” (Figure 4). If the decoration was sent to the recipient, or his next of kin, the date of posting is indicated in the “Remarks” (Figure 5). Often the date of death of the recipient is indicated. The cards may be downloaded at: http://discovery.nationalarchives.gov.uk/browse/r/r/C14593. 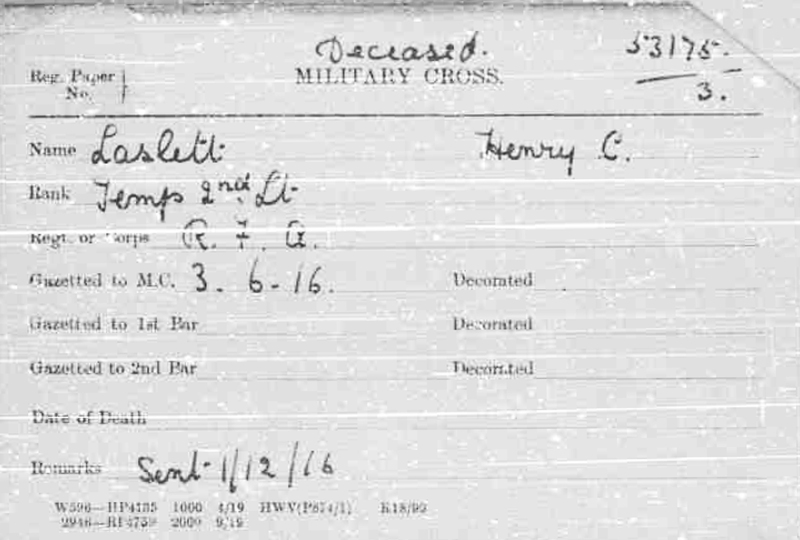 Figure 4: Military Cross Card for a recipient who was decorated by the King (WO 389). 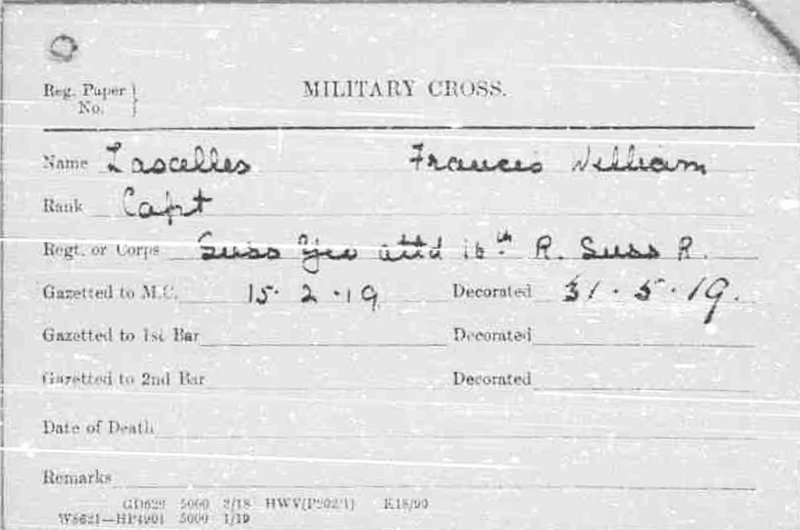 Figure 5: Military Cross Card for a recipient whose decoration was sent to him (WO 389). 4. 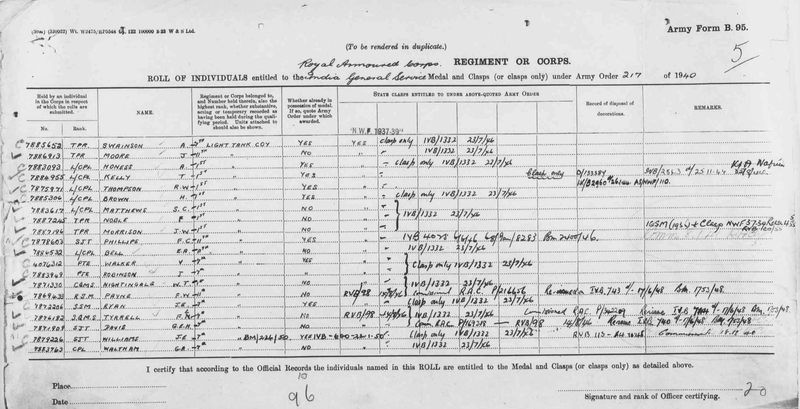 The Distinguished Conduct Medal Register (WO 391). The Distinguished Conduct Medal Register lists all recipients of the Distinguished Conduct Medal from 1954 to 1998. The portion of the Register that covers the Great War period depicts the London Gazette announcement of the award and for those citations that do not contain information on the date and location of the action for which the award was made, that information is annotated below the citation (Figure 6). These files may be downloaded at: http://discovery.nationalarchives.gov.uk/details/r/C14595. 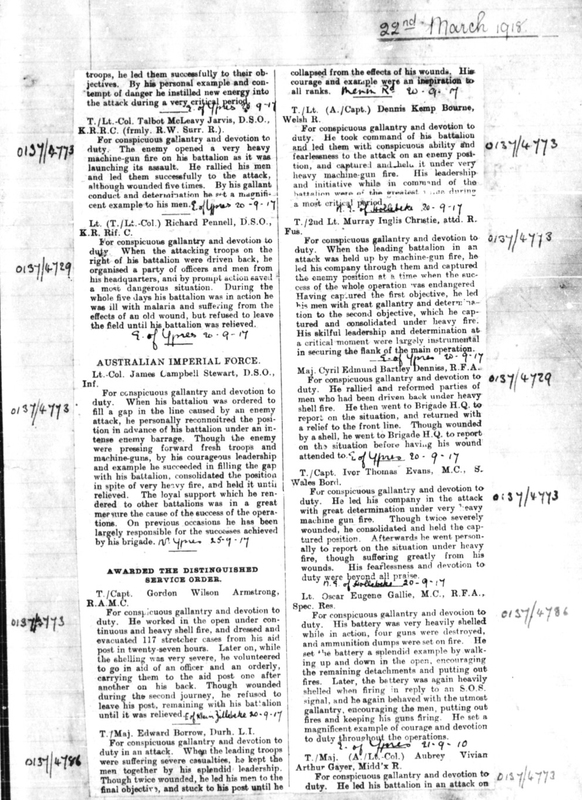 Figure 6: Sample page from the Distinguished Conduct Medal Register (WO 391). This series contains medal rolls for all those British campaigns for which The National Archives holds records, including most, if not all, of the campaigns that have occurred between 1902 and 1948. Three examples of these rolls are illustrated below: Indian General Service Medal 1908-35 (Figure 7). Indian General Service Medal 1936-39 (Figure 8); and the General Service Medal 1918-62, clasp PALESTINE (Figure 9). These files may be downloaded at: http://discovery.nationalarchives.gov.uk/browse/r/h/C14308. 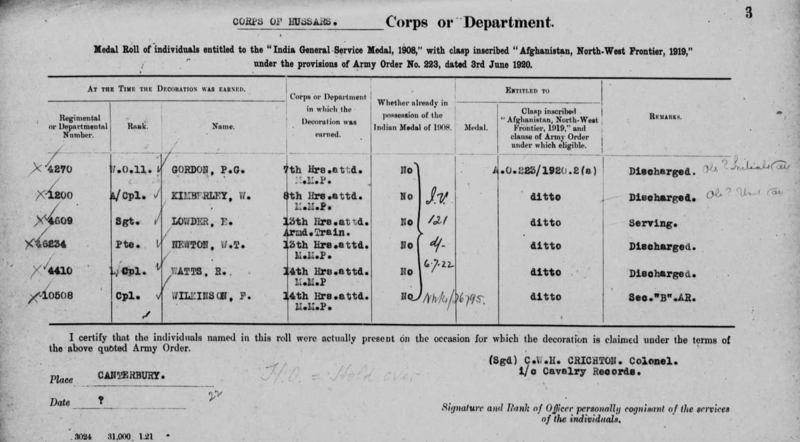 Figure 7: Sample page from the medal roll for the Indian General Service Medal 1908-35 (WO 100/467). Figure 8: Sample page from the medal roll for the Indian General Service Medal 1937-39 (WO 100/500). Figure 9: Sample page from the medal roll for the General Service Medal 1918-62 with clasp PALESTINE (WO 100/501).